AMSOIL Synthetic V-Twin Motorcycle Oil (MCV) contains a heavy treatment of anti-wear additives to reduce wear regardless of the operating conditions. It is thermally (heat) stable and contains maximum levels of oxidation inhibitor additives. 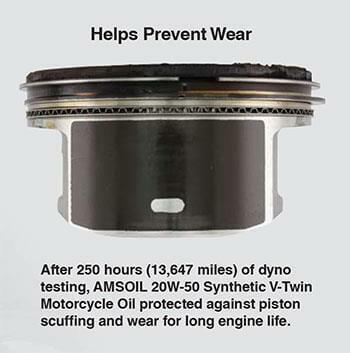 After 250 hours (13,647 miles) on an engine dyno, AMSOIL Synthetic V-Twin Motorcycle Oil eliminated piston scuffing and wear for long engine life and maximum power (see image). AMSOIL 20W-50 Synthetic V-Twin Motorcycle Oil (MCV) is a premium oil designed for those who demand the absolute best lubrication for their motorcycles. It is the result of extensive research and is specially formulated to excel in all areas unique to motorcycles, including the high temperatures of air-cooled engines such as Harley-Davidson* V-twins, wet-clutch lubrication, extreme-pressure regions of gears and chains and rust common to short trips and storage. AMSOIL Synthetic V-Twin Motorcycle Oil is multi-functional and fulfills the requirements of both domestic and foreign motorcycles. AMSOIL 20W-50 Synthetic V-Twin Motorcycle Oil (MCV) contains no friction modifiers and promotes smooth shifting and positive clutch engagement. It controls heat and helps prevent slippage and glazing, while its high TBN helps improve clutch life by resisting the acids that can degrade clutch material. For off-road use, change AMSOIL 20W-50 Synthetic V-Twin Motorcycle Oil (MCV) at motorcycle manufacturer-recommended intervals. How can AMSOIL recommend 20W- 50 Synthetic Motorcycle Oil for use in the primary chaincases and transmissions of certain motorcycles? AMSOIL 20W-50 Synthetic Motorcycle Oil is engineered with premium additive packages specifically designed to provide high performance in motorcycle engines, transmissions and primary chaincases. However, if a customer does not want to use it in all three sumps, AMSOIL Synthetic V-Twin Transmission Fluid (MVT) and Synthetic V-Twin Primary Fluid (MVP) are secondary recommendations. AMSOIL recommends 20W- 50 Synthetic Motorcycle Oil (MCV) for Harley-Davidson Sportster engines, transmissions and primary chaincases. “It’s the freedom you feel when you’re on the road. The sound of the engine. The freedom to go where you want. It’s a time for you to think and really be one with yourself.” Watch the video to see Dean’s full story. If AMSOIL Synthetic V-Twin Primary Fluid and AMSOIL Synthetic V-Twin Transmission Fluid are specific to primary chaincases and transmissions, why continue using 20W-50 Synthetic Motorcycle Oil for all three areas? Wouldn’t Synthetic V-Twin Primary Fluid and Synthetic V-Twin Transmission Fluid provide better performance? In certain cases, they do. However, 20W-50 Synthetic Motorcycle Oil offers the convenience of using one lubricant for all three areas of your bike. It delivers excellent performance in transmissions. Synthetic V-Twin Primary Fluid offers a little extra benefit with consistent clutch performance and helping find neutral easier, while Synthetic V-Twin Transmission Fluid offers a little extra benefit by helping quiet noisy transmissions and aiding in smoother shifts. What is the viscosity of AMSOIL Synthetic V-Twin Primary Fluid and AMSOIL Synthetic V-Twin Transmission Fluid? Synthetic V-Twin Primary Fluid has the physical characteristics of an SAE 50 motor oil. This does not mean it can be used in engines - it is merely a universally understood reference to its viscosity. Do NOT use Synthetic V-Twin Primary Fluid in the engine or transmission. Refer to the data bulletin (G3302) for further typical technical properties. AMSOIL Synthetic V-Twin Transmission Fluid has the physical characteristics of an SAE 110 gear lube. Although it has the properties of a gear lube,it is NOT a specification-rated gear lube. It is designed to perform in transmissions used in modern separate-sump V-twins. Do NOT use it in the engine or primary chaincase. Consult the data bulletin (G3301) for additional information. Why does the V-Twin Oil Change Kit contain extra oil for my motorcycle? The AMSOIL V-Twin Oil Change Kit is designed to satisfy the requirements of as many bike models as possible. Some may not require the full four quarts. The kit includes quarts rather than a gallon so riders can easily store and use the leftover oil when needed. Check the owner’s manual or the AMSOIL Motorcycle Product Guide for the exact capacity. filter wrench fits AMSOIL Ea Motorcycle Oil Filters. Be sure to check out the full line of AMSOIL motorcycle oils. There you will find AMSOIL 10W-40, 10W-30, 15 W 60, SAE 60, 20 W 40, along with oils for dirt bikes and transmission fluids for V twins. Have you been asking yourself the question where can I buy AMSOIL motorcycle oil locally? If you'd like to get the best possible price on AMSOIL MCV or any other AMSOIL products, the AMSOIL preferred customer membership may be right for you. This will allow you to order any AMSOIL products directly from AMSOIL Inc. at wholesale pricing along with free shipping offers. 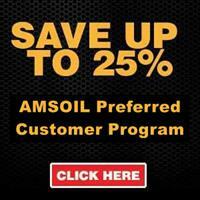 Products are shipped directly to your door from the nearest AMSOIL distribution center. Typically you will have your motorcycle oil sitting on your doorstep within one to three days. Using this method you can get the best price, free shipping, and the latest formulations without all the hassle of trying to find a dealer or store locally. To get more details about these offers check out the preferred customer program. Find out how to change motor oil on a Harley-Davidson motorcycle. Today we're going to do an oil change on a Harley Davidson Softail 2014 Fat Boy Lo with a 103 cubic inch engine. Before you begin, it's a good idea to start your engine and let it run for a bit. This will warm up the oil so that, when s you're ready to drain it, it will flow easier. Before we get started, you're going to need a few tools. You'll need an oil drain pan, a ratchet, a 5/8-inch socket, 5-inch extension, your torque wrench, a filter wrench, a filter, which comes in black or chrome, and motorcycle oil 20W-50. On Softail models, you'll find your oil reservoir underneath your seat. If you look directly below and slightly behind, underneath the frame you'll find your oil drain plug. Take your ratchet and your 5/8-inch socket and remove your drain plug. Now, I like to move my pan into place and remove the plug by hand. The reason I remove my drain plug by hand is I don't like to drop it into the oil. Then remove the oil reservoir cap to increase the oil flow. In order for all your oil to drain, you need to have your bike in a vertical position. So, if you're working on a table like this, you're okay. But if you are working off of a kickstand, make sure you bring your bike to an upright position in order for all the oil to drain. Next we're going to remove the oil filter. I already put a few towels into place to catch any residual oil as I remove the filter because there will be oil that drips. I also slide my oil pan underneath for any other oil that may drop through. So take your ratchet, your 5/8-inch extension and your filter wrench and remove your filter. So once your filter gets loose, you can finish removing it by hand and quickly move it into your oil pan. So now you're going to want to take some shop towels and clean up any residual oil that may have spilled when you removed your filter. Take your new filter. You want to put just a little bit of oil, a real light film on your gasket. Don't overdo it. You want a light film to ensure a proper seal when you put the new filter back on. So continue tightening it by hand until you feel the gasket snug up. Then turn it another half to three-guarters of a turn to complete the install. So now we're going to put our drain plug back in. Make sure you clean all the residual debris off of your drain plug. I've already done that. You want to take a new o-ring and put it on your drain plug before we start, and I like to start mine by hand. Just snug it up. Take our torque wrench and 5/8-inch socket. Finish. The torque wrench should be set at 14 to 21 foot-pounds of torque. Mine's set at about 16, Okay. That should be tight. We've replaced the drain plug and installed a new oil filter. Now it's time to add some oil. I use AMSOIL 20W-50 V-Twin Motorcycle Oil. The Softail calls for three quarts of oil. I'm going to start with 2 1/2 quarts of oil.Now for the second quart. I'm going to add the last half quart of oil, which will bring me up to 2 1/2 quarts of oil. Remember the Softail calls for three quarts of oil, and I'm only adding 2 1/2 at this point. It's very important not to overfill the reservoir on a Softail. So I'm going to take my bike out, run the engine up to operating temperature, come back, check my oil levels again; and then I'll top it off as necessary. I just got back from bringing the engine up to temperature. In fact, you can still hear the bike cooling down. Remember to check the oil while it's hot and on the kickstand. So, as you can see, we need to add just a little bit more. Okay. Now that I've topped it off, I'm going to put my dipstick back in, check the fluid level. The fluid level is right where it should be. We're good to go. As you can see, it's relatively easy to change the engine oil on a Harley Davidson Softail.